Ohaus Navigator (NV), Navigator XL (NVL) and Navigator XT (NVT) scales – what’s the difference? 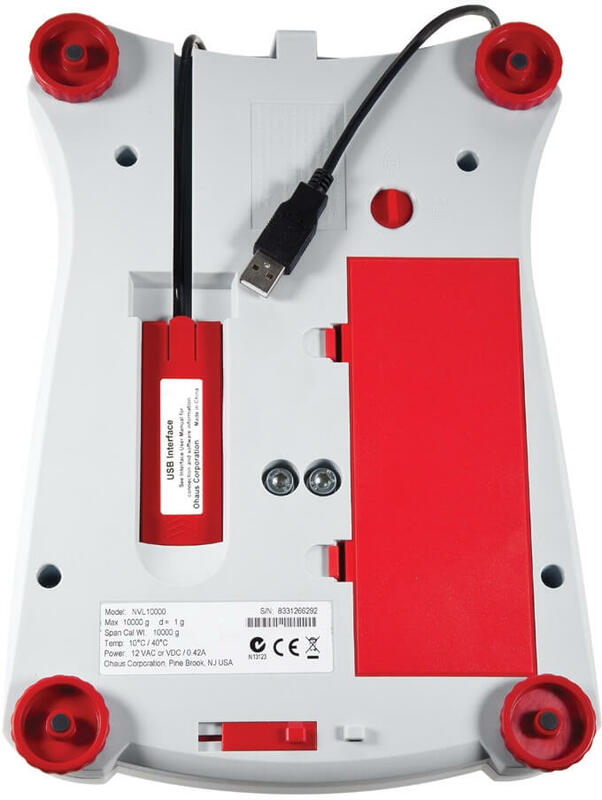 The Navigator (NV) is the only one with different platform shapes within the series: The NV212 – the only scale with 0,01g readability in the entire range – has a round platform as shown in the picture while higher capacity scales have a platform which is similar to the other series. 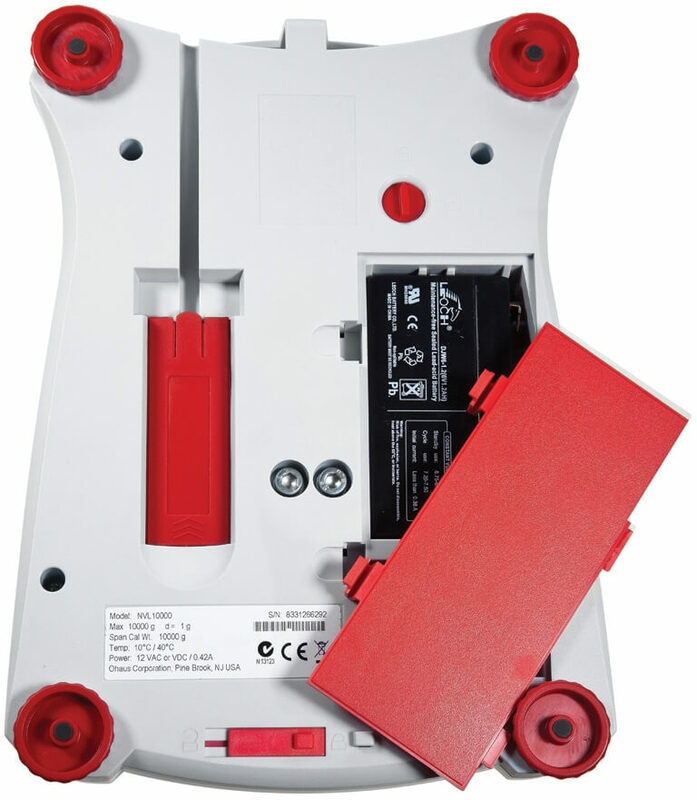 The scales can also be used with non-rechargeable batteries (4 size AA batteries for the NV and 4 sice C batteries for the NVL and NVT). The values are expressed in scale intervals (d, difference between two successive indications, often also referred to as “(display) division” or “readability”). OCL stands for off center load. To minimize the OCL error, place the weight in the center of the platform. Approved models are not included in the table as their availability varies by region. 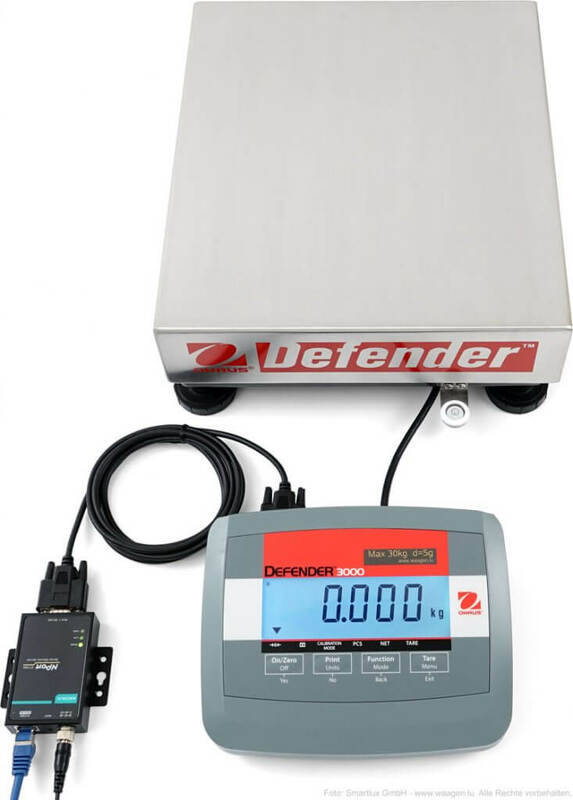 Many scales and balances are equipped with an RS-232 interface. 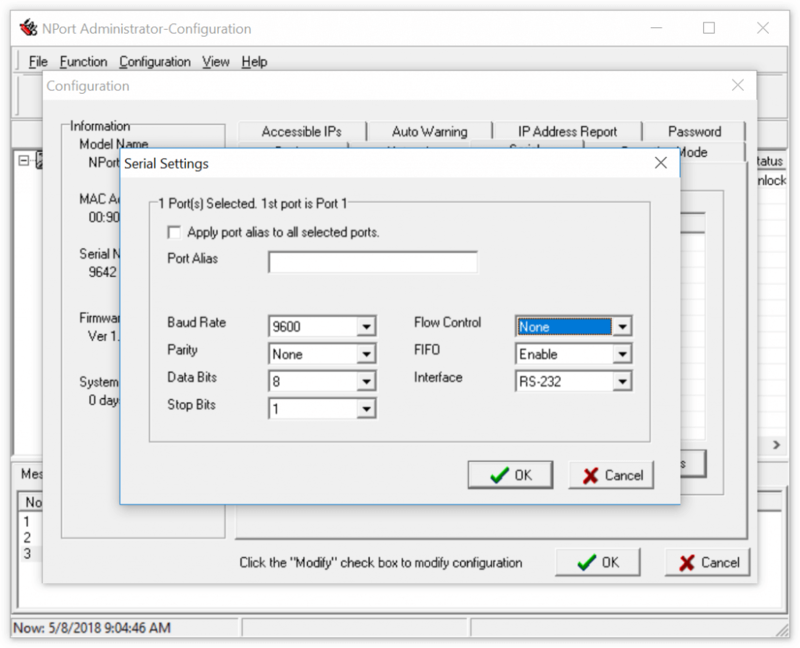 Moxa’s NPort series and similar serial device servers allow you to connect such scales to a network (Ethernet). In this article, I’ll show you how to connect a Moxa NPort 5110A to an Ohaus scale and how to configure and test it. Data cables (red) are not included. 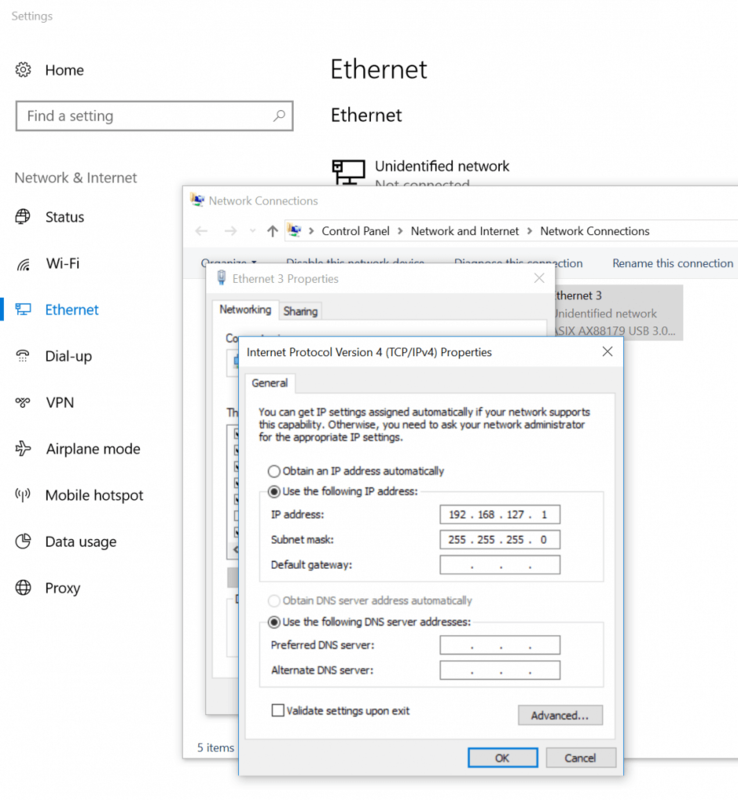 Connect the NPort directly to a single computer (not a LAN) with an Ethernet cable. Use the NPort Administator software included with the device to configure it. It should be found at the default IP address (192.168.127.254). 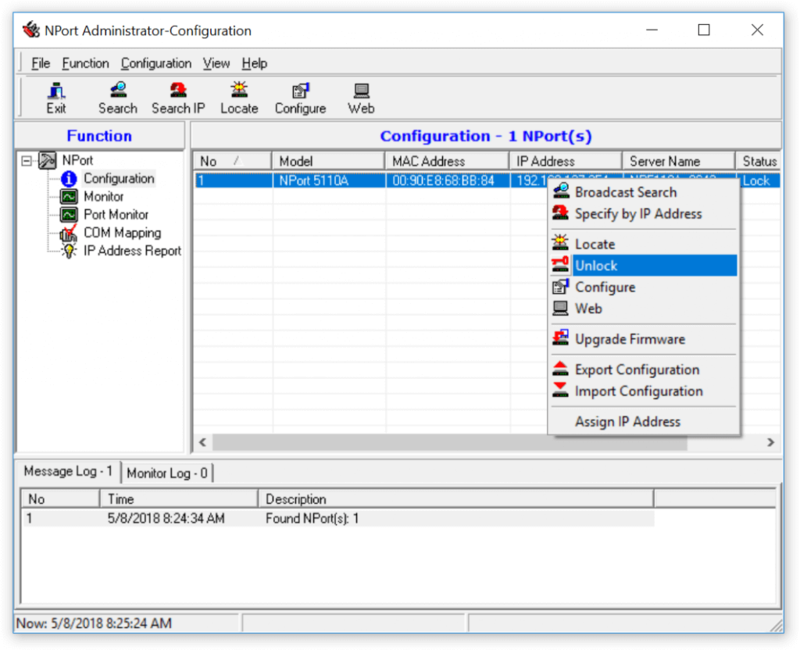 Note: It’s not always necessary to change your PC’s IP address if you’re running the NPort Administrator software. However, if you receive error messages during the following steps, try to temporarily set your computer’s IP address to an address on the same subnet (such as 192.168.127.1). The default password is “moxa”. 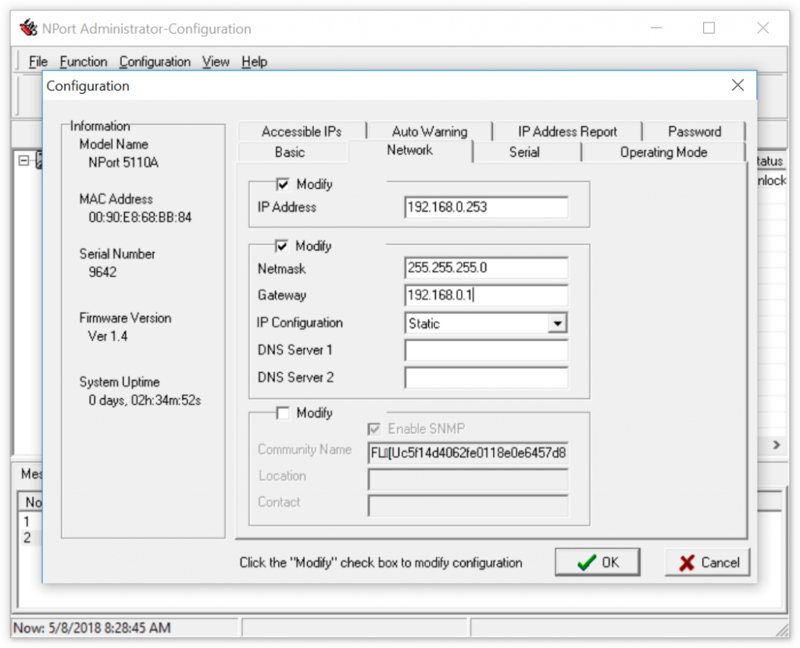 Enter a static IP address, subnet mask and gateway that work on your network (or select DHCP or BOOTP for automatic address assignment, though this is not recommended for most operating modes). 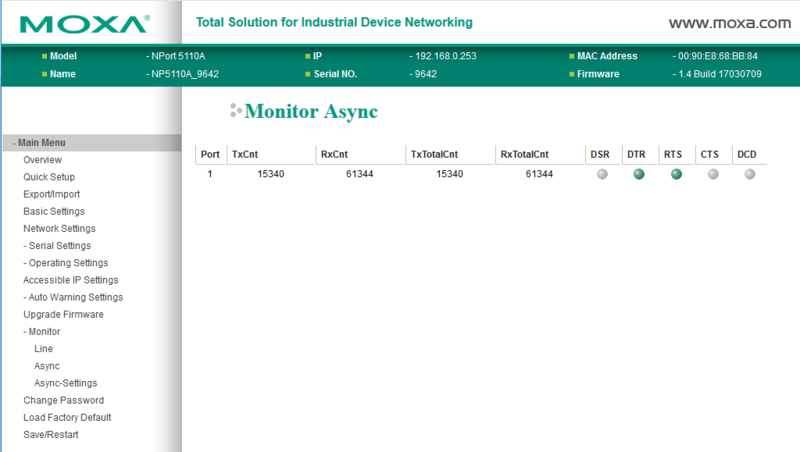 With the network configuration complete, you can disconnect the NPort 5110A from your computer and connect it to your network (LAN). Important: By default, the NPort is set to CTS/RTS flow control! 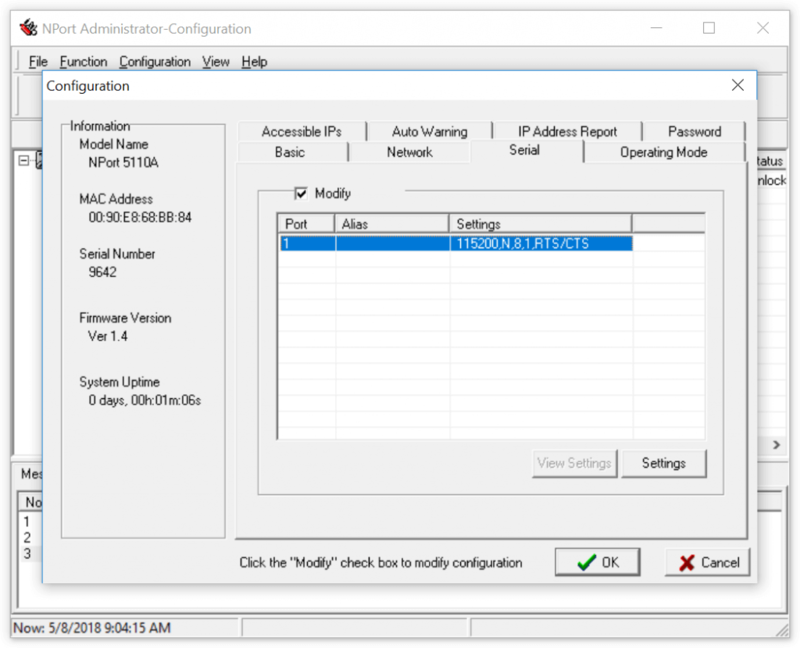 You cannot change this setting when using the Setup Wizard through the web console. As mentioned before, I recommend using the NPort Administrator software instead. 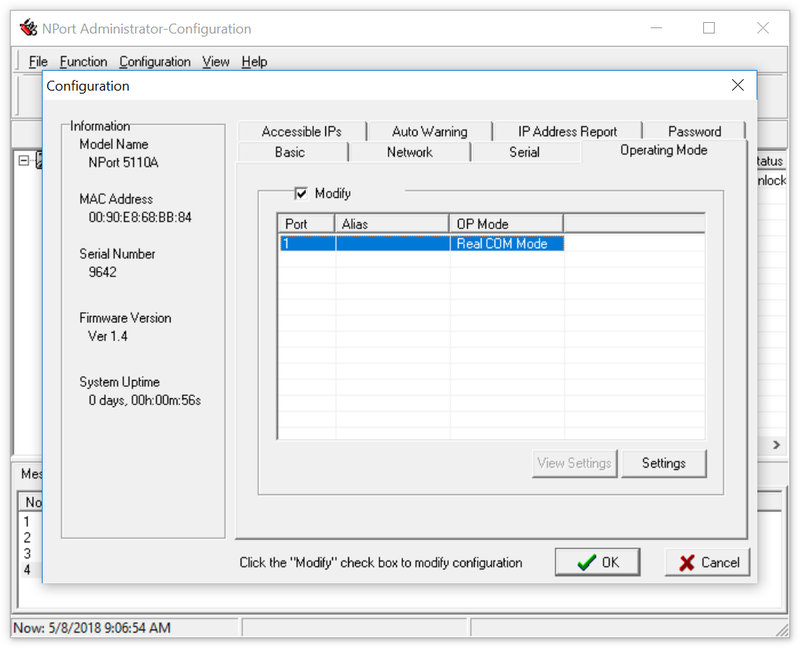 Real COM mode: This mode allows you to create a virtual COM port on a PC and use the scale as if it were connected directly to that PC. This is very useful when you’re using software which only supports connections to COM ports and cannot communicate over TCP/IP (such as our 232key virtual keyboard wedge software). Please note that you’ll have to install a virtual COM port driver on the PC that communicates with the scale. 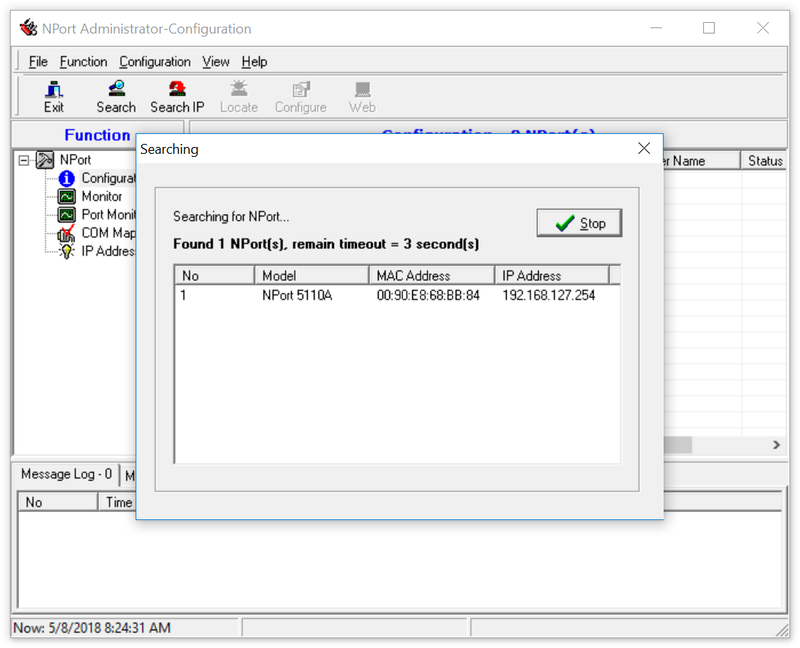 In my tests on Windows 10, setting up the COM port through NPort Administrator did not create a new virtual COM port on the system. 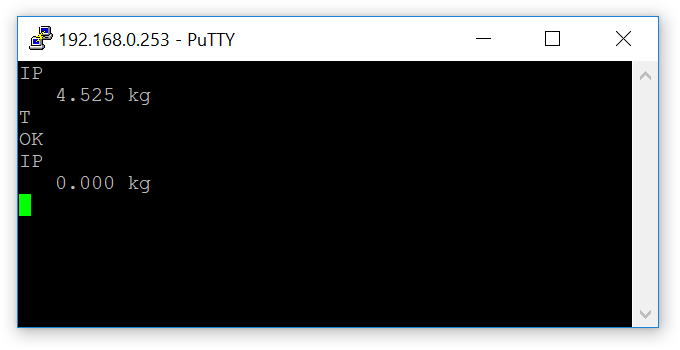 However, using the NPort Windows Driver Manager worked. 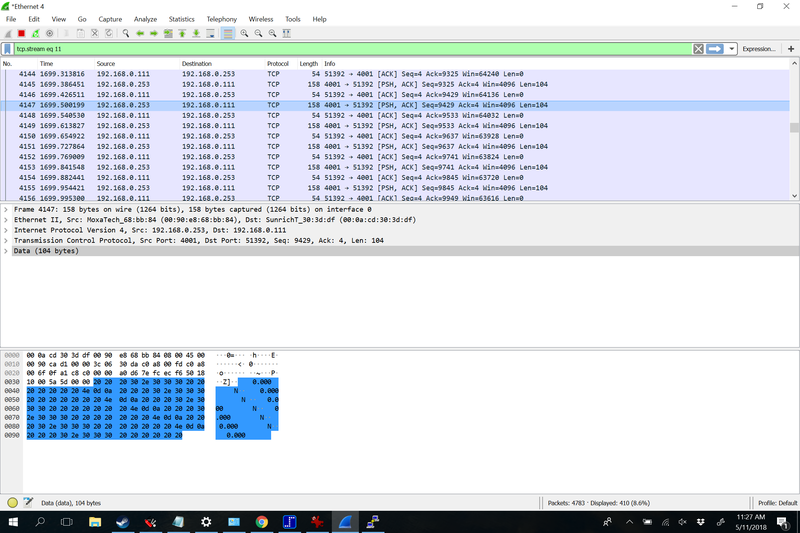 TCP Server: The NPort acts as a server, waiting for incoming connections from TCP clients on port 4001 (or on another user-defined port). The maximum number of concurrent connections can be changed from 1 (default) to up to 8. This mode works with software like our Simple Data Logger and many others. Note: It is not necessary to set the data packing options unless you want to optimize either for minimal latency or maximum throughput. By default, the device will try to find a reasonable compromise (this is likely achieved by observing the delay between the data received over RS-232 to determine when a “line” of data is complete). For further details and for information on the other modes, please consult the user manual. A terminal program like Termite or HTerm can connect to the virtual COM port. Make sure that the connection parameters correspond to the settings of your scale. The “Ready” LED should be green. The “Link” LED is green when the NPort has established a 100 Mbs Ethernet connection and orange on a 10 Mbps connection. I hope this article has been useful. 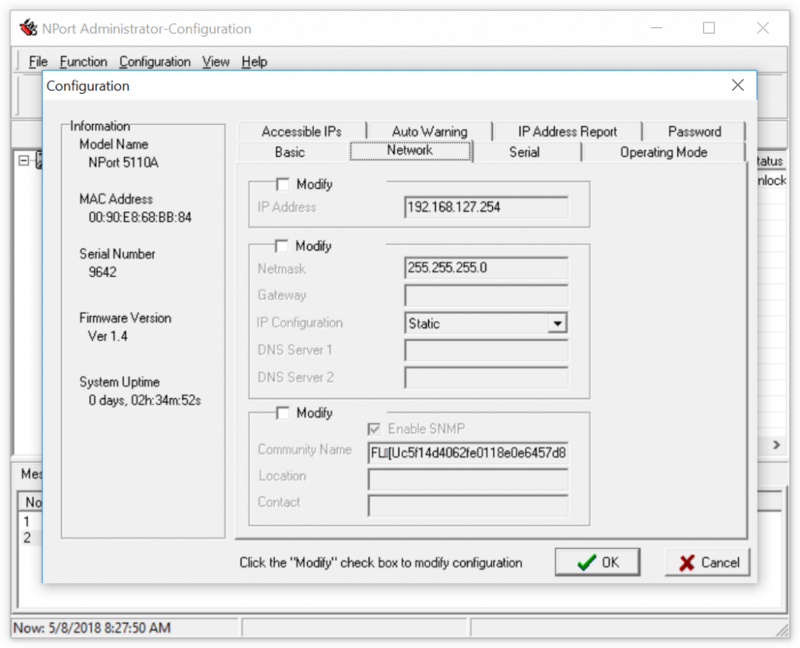 What are your experiences with Moxa’s NPort serial device servers? Please don’t hesitate to leave a comment! For support, please contact Moxa or your vendor. Purchase a PDF version of this article (contains no additional information). Connecting your scale to a PC and recording the weight should not be a difficult task. However, data logging software available from scale manufacturers or third parties is often expensive, difficult to use or frustratingly unreliable. We developed Simple Data Logger (SDL) to address these issues. 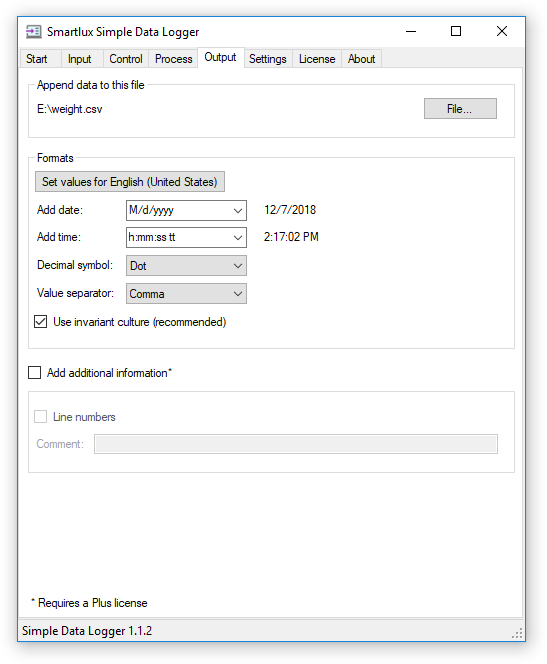 SDL writes the weight received from a scale or balance to a file, optionally adding the date and time. The CSV files generated by SDL can easily be opened in Excel and other spreadsheet applications for further processing and visualization. COM port: RS-232, USB virtual COM port, Bluetooth SPP, etc. TCP/IP: Ethernet, WLAN (raw TCP format only). Note: Your scale has to send data in ASCII format. If your scale or balance is listed in SDL, simply select it and press the set default parameters for device button. 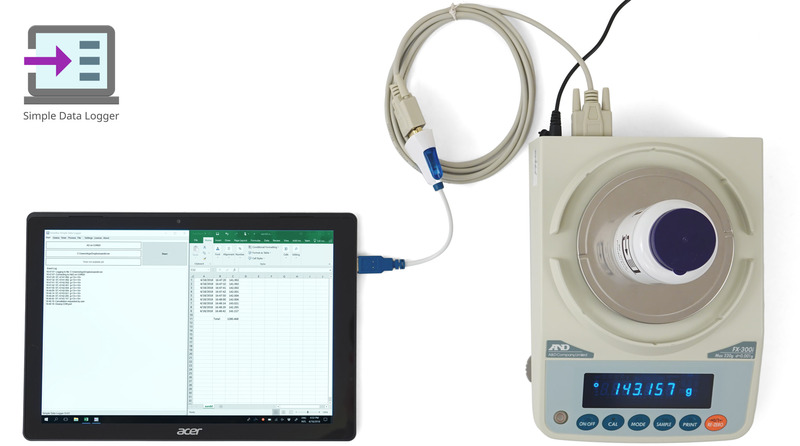 Otherwise, select “generic measuring instrument” and enter the interface parameters manually. 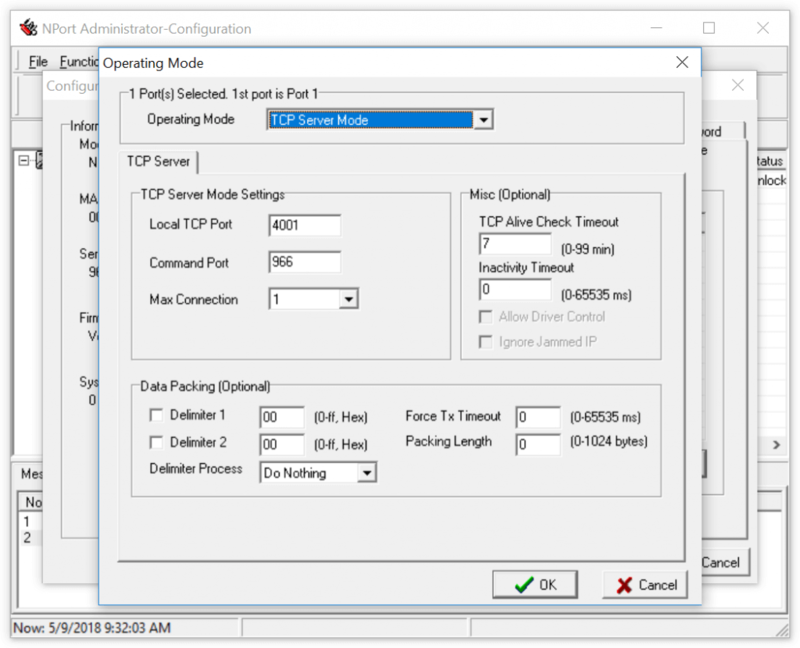 Set the radio button to match your connection: COM port (RS232, USB VCP, Bluetooth SPP) or TCP/IP.Make sure that you’ve specified a terminator (a.k.a. delimiter, the last character your scale sends in each line of data) or a timeout (e.g. 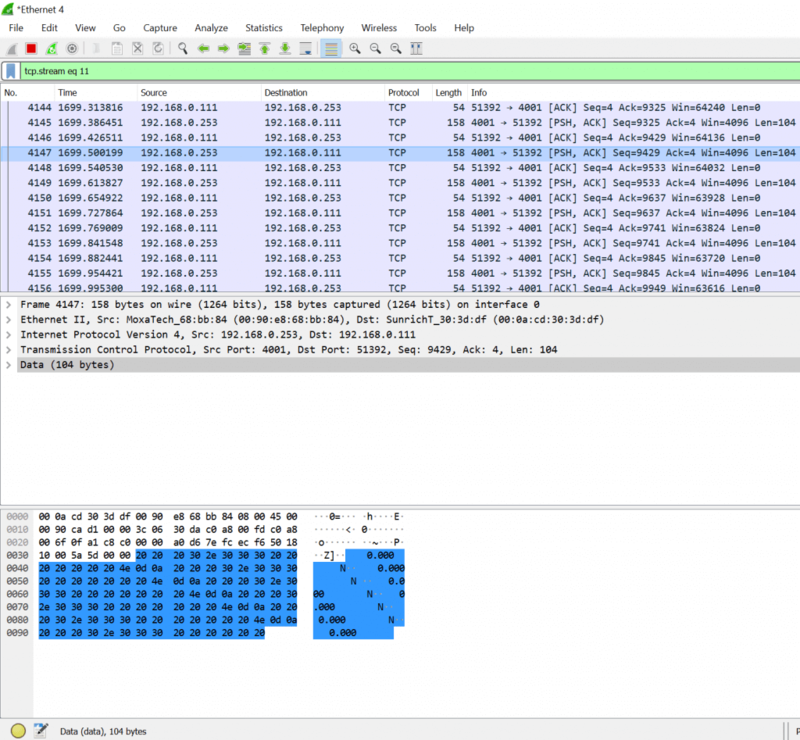 100ms, SDL will process received data if no additional data is received during this time). Choose a file for the recorded data. SDL will create if for you if it does not exist (otherwise, data will be appended). Choose (or enter) a date and time format or select “None” from the list if you do not want SDL to add the date or time. Pick a decimal separator (for numeric values) and value separator (used to separate values from each other). The correct settings for your locale can be made automatically by clicking on the set values button. Press the start button to start recording data. Press the “PRINT” button on your scale or balance to send the weight to SDL. Depending on you scale, this button might have a different name (e.g. “DATA”). Some scales like the A&D FX-300i used in this example also have to ability to automatically transfer each (stable) weight. 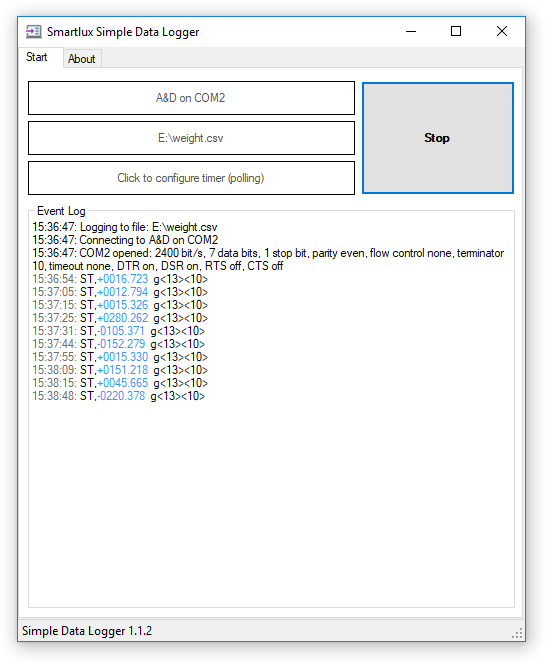 Data received will be shown in the event log (with the captured weight value shown in blue) and the weight will be written to the chosen file. Press stop to stop data logging and to close the file. Note: SDL can also handle continuous streams of weight data if this is what your application calls for (we’ve tested it with a scale which sends 100 values per second). 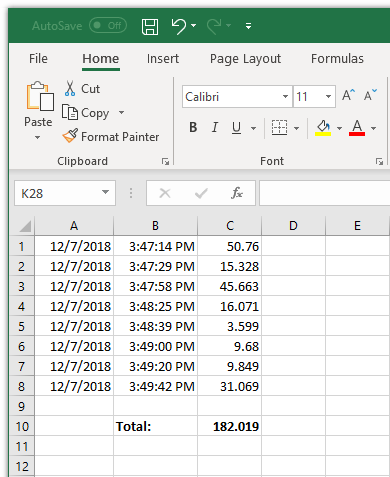 The total number of recorded values is only limited by your disk space (but please keep in mind that Excel cannot open files containing more than 1,048,576 rows). Everything shown here can be done with the “Basic” version of SDL (which is free for personal, non-commercial use). The “Plus” version has additional features including a timer to request the weight from the scale in user-defined intervals. Very affordable licences can be purchased from our partner FastSpring (immediate license delivery).